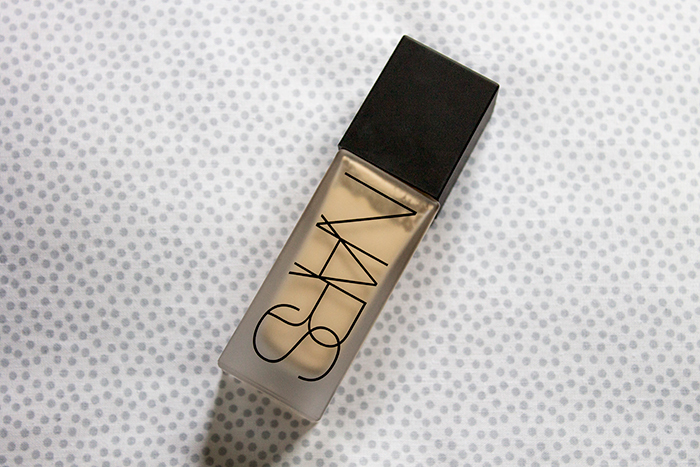 Some of you may know my love for NARS, particularly the Sheer Glow foundation so I was overjoyed when my boyfriend kindly picked up a little birthday gift for me in the form of the NARS All Day Luminous Weightless Foundation. Admittedly, he did think he was picking up Sheer Glow at the time but the shade was spot on (Mont Blanc) and who doesn't love trying out new products? Here's how I got on. The NARS All Day Luminous Weightless Foundation is an oil-free, long wearing, full coverage foundation said to have a weightless feel and 16 hours of wear. Just from the description, it sounds like a great alternative to Sheer Glow if you're looking for something a little more long lasting. Lets start with the coverage. Compared to Sheer Glow, it is definitely more of a full coverage foundation so a little goes a long way with this stuff. I found that it was much better at covering blemishes or redness than the alternative so if your skin is a little more problematic, this might be the one. With the nature of the full coverage, long lasting formula, I do find this to be much more suited to those with oily skin such as myself. If you have any sign of dryness, it's not forgiving in the slightest. This can be fixed with a little bit of powder to an extent but I do find I need to take extra care with exfoliating and moisturising before popping this on. With the foundation being full coverage, I wasn't too sure about the weightless claim but it definitely does live up to it's word. It feels just like Sheer Glow on the skin which makes me feel more at ease wearing that level of coverage. You can tell it's full coverage but it still has an element of a natural look which I love, no one wants to look like they've dipped their face in foundation! With the title "All Day" and "16 hours of wear" claims, I'm happy to report that this is the case too. Although I love the look of Sheer Glow, it doesn't last on my skin quite as well as this foundation. I'll still get oily patches every now and then but it's good to know that I don't need to be armed with powder everytime I leave the house for a couple of hours. For those wondering about the shade, I wear Mont Blanc in both foundations and I find they both appear the same so if you're one shade in Sheer Glow, it's likely you're the same in this one. However, I do find that this foundation can oxidise a little but more than Sheer Glow so if you're usually between shades, it might be best to opt for the lighter shade for All Day Luminous. For me, I feel like this foundation does exactly what it says on the tin. I feel like it's strengths are where Sheer Glow can sometimes fall flat but would it replace Sheer Glow? Probably not. I think both foundations are great in their own way, it really just depends on what skin type you have whether which may be better suited for your overall needs. If you have oily skin and need something that will last on your skin, it's definitely worth checking out.